The Sutton Gilbert Union was incorporated in 1791. Its member parishes eventually included Barlavington, Bersted, Bignor, Burton, Bury, Clapham, Coates, Coldwaltham, Duncton, Egdean, Fittleworth, Greatham, Heyshott, Patching, Slindon, Sutton and Warningcamp. In 1791, the incorporation established a workhouse at Sutton End. A house now known as Farriers on The Street in Heyshott is said to have once been the parish's workhouse. 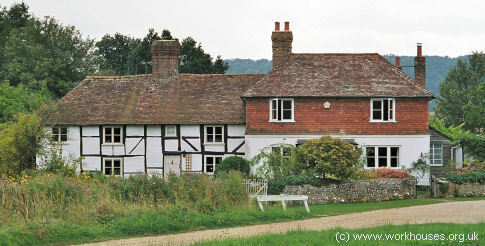 Heyshott former parish workhouse, 2004. Because of its Gilbert Union status, Sutton was exempt from most of the provisions of the 1834 Poor Law Amendment Act. It continued in operation until 1869 when all remaining Gilbert Unions were abolished. Its member parishes were distributed between the East Preston, Petworth and Westhampnett Poor Law Unions. West Sussex Record Office, County Hall, Chichester, West Sussex PO19 1RN. Only holdings are Guardians' minutes (1791-1826).